Finally, the key to this routine is the “resistance”. That is, the amount of weight hanging from your fingers during each set. This varies greatly from athlete to athlete, so you will have to figure it out yourself through trial and error. A big hint: start out with much less resistance than you think you should. There are basically no consequences to using too little resistance, but potentially devastating consequences to using too much. For many people the resistance will be LESS than bodyweight, which means you will need to rig up a simple pulley system to REMOVE weight. You can get a pulley kit here, or assemble your own. Hangboard FAQ #2 addresses the “resistance” issue in a lot more detail, and explains how to rig a pulley system for removing weight. And while you’re at it, you might as well read Hangboard FAQ #1.
hi, any advice on when it’s appropriate for a climber to start using the hangboard? 5.11 climbers, or 5.12 and up only? This is a great question. Unfortunately I get it often enough that it qualifies as a Hangboard FAQ, so now instead of simply answering your question here, I am compelled to write another blog post 😉 Look for a new post on this topic in the next few days! Just read the newest post: thanks for the insight! Also, I haven’t forgotton about your other questions (RE: Trying Hard & Agression). I am working on the answers and will address the first one soon…. Thanks for continuing to share your training knowledge with the masses , I have a question regarding rest time and what you should be feeling between sets. For your hangboarding protocol you call out a 2-4 minute rest between sets before starting the next set of the same grip, should you be targeting 100% recovery? I’ve noticed that weight lifters targeting Hypertrophy generally try to keep the stress on the muscles and not give them enough time to fully recover, but I am not sure this applies since hangboarding is an isometric exercise. I have also noticed that the weights that I can hang are much higher when I allow myself to rest 3 minutes between sets vs 2 minutes but I’ve been sticking to 2 minute rests due to time constraints. Does the set rest time even have an impact on the effectiveness or quality of the workout? I rest 3 minutes between sets, but some times I’m not ready to go for the next set (busy taping, brushing holds, etc) so that will occasionally creep up towards 4 minutes. I do not reach 100% recovery in three minutes (or even 4). I feel gradually compounding fatigue as I move from set to set, but I don’t feel completely pumped either. I agree with your observation of weightlifters. This is not a power workout (although a hangboard could be used for power training), so there should be some cumulative fatigue. As for your second question, I suspect that the rest does indeed impact the quality of the workout, but I don’t know if that is significant enough to worry about. The risk here is that the workout becomes more of a power-endurance exercise rather than a strength-building exercise. The key is to rest enough that you can complete the next set (which should be “harder” than the previous set within a given exercise). If you are consistently able to do the 1st set but not the next two, try increasing the rest. Finally, if you have time constraints, strive for quality over quantity. So rather than do 7 exercises with 2 minutes rest, consider 6 with 3 minutes rest. Good luck! Thanks for sharing, I think that for me describing the feel of the workout really provides a lot more insight into the goal, design, and process of the workout than just a duration, and what you wrote was exactly what I was looking for. I will bump my rest times up to 3 minutes while reducing the number of grips to 5 – I should also reconsider the weights I add, maybe I have been adding too much weight too soon, between sets I am only adding 5 pounds and I have difficulty completing sets 2 and 3 (but maybe a longer rest will fix this). I’ll have to mess around with this when I have some down time to see what weights provide perceived exertion levels on the various holds I train and re-read the training intensity post. One comment though: You’ve been doing this hangboard stuff for years, and I am completely new to it, first off. I am not claiming to be anywhere near an expert or telling you personally to change anything, but I am a little worried about the way your shoulders are shrugged in your dead hang posture. I think for some people, myself included, and maybe other people like me with completely un-athletic bodies, this could potentially cause problems in the shoulder. Shouldn’t hangboard posture be similar to the beginning of a pull-up, where the shoulders are packed down and back into the joint? Again, I will admit I don’t really know what I am talking about, just basing this on things I’ve read recently on the Internet, and from tweaking my own shoulder. What do you think about Ryan Palo’s posture, around 1:20 to 2:10 into this video? Thanks for the comment. I have a number of thoughts; first off, don’t do anything that feels uncomfortable or threatening. There’s an old proverb I like, “every cripple has his own way of walking”. This describes climbers to a T. We all have our nagging aches and pains, and have to find an effective way of managing those quirks. So do what feels right to you. I’m familiar with Ryan’s posture and I use it myself from time to time. I find it makes it slightly easier to the grasp the hold, by moving your center of mass “behind” your hands, thus causing your body to rotate slightly, providing a more positive aspect to the hand hold (if that makes any sense–experiment with it and you’ll see what I mean). So I use it to “cheat” at the end of super hard sets (although I’m not saying its any easier, just a change of pace). On the fipside, that position is also much more strenuous for the upper arms, which probably explains Ryan’s huge guns! I lack the bicep endurance to maintain that position throughout an entire workout, plus I find this position makes it hard to relax the lower body, and can lead to excessive arching of the back. So bottom line, IMO it makes things a bit easier for the fingers but much harder for the biceps. This leads into the question of Isolation vs. Complex Movements, but that is a topic for another day…. That said, I *think* my posture is ok. The T-shirt I’m wearing is bunching up around my neck, making it look more extended than it really is, but there is a good deal of muscular tenstion throughout my shoulders and elbows, and this position is not the least bit painful or tweaky for me. Furthermore, this is a very common shoulder position in rock climbing (though usually one hand would be dropped, chalking or shaking). Anyone who climbs with straight arms will use this position constantly. Anecdotally, I’ve used this position for literally 10 years, adding as much as 80 lbs to my body weight, without the slightest problem. Ultimately it comes down to what feels right for you. There is nothing “wrong” with Ryan’s position, so if that feels better to you, use it! Thank you very much for the reply! I experimented with the two hangboard postures above and found that you are right on. Paying close attention to my overall posture, I was able to do a complete set of hangboard workouts, and am now in the middle of my second periodized training session. The results are certainly noticeable. I am not sending 5.13 or anything, but feeling much more comfortable on traditional leads at grades that used feel very difficult and a bit scary. To that effect, I would agree with what you say in your “Rock Prodigy” document that it is never “too early” to start training. As you also said, I am finding that incorporating technique into the ARC training can be very useful for more of a “beginner”. Anyway, I will stop repeating what you have already said, but, thanks again for posting all of this information! 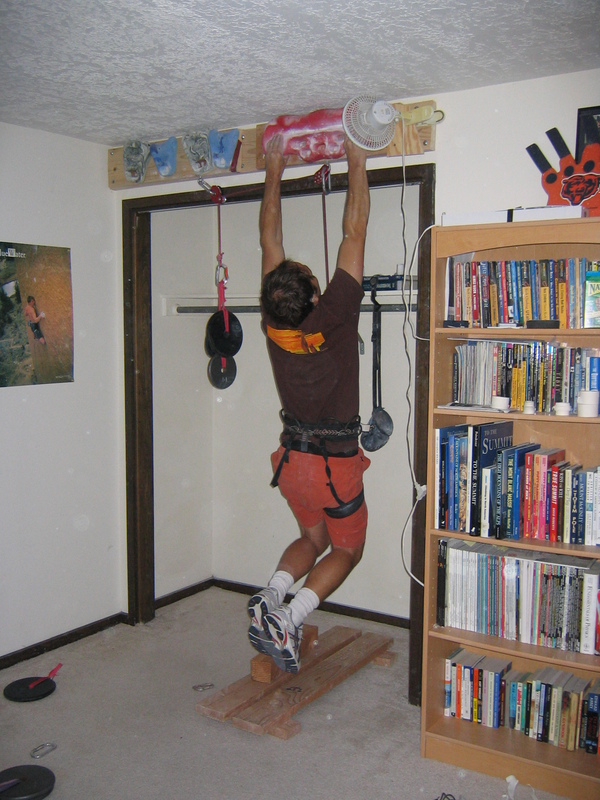 What’s your advice for warming up if you’re using a hangboard set-up at home, rather than in the gym? I only have a small space so can’t create a home wall for easy climbing to get warmed up. Does taking a lot of weight off your feet and doing very easy hangs work as well? Your best option is to install a “kick plate” low to the ground behind your hangboard. There’s a photo of a hangboard with a kick plate on page 162 of the RCTM. With a kick plate you can wear climbing shoes and get your feet involved in your warmup, which makes things a lot more interesting and realistic. Then simply traverse around your hangboard, using various holds, shaking out, until you’re warm. I’ve noticed that other training sites such as Eva Lopez and Dave Macleod recommend doing a single rep of 10 secs at max weight followed by a 3 min rest rather than the repeaters you recommend – would you be able to clear up my confusion over this. BTW – fantastic book, I’m just starting the strength phase. You will have to ask Eva and Dave to explain the reasoning behind their protocols. They’re both quite smart with plenty of experience so I’m sure they’ve thought it out thoroughly. The Rock Prodigy program uses hangboard training to build strength, and that is the reason we prescribe repeaters on the hangboard. More discussion on this topic can be found on our forum.